In 19th century Britain people, only the upper classes could afford wine and brandy, with the working classes preferring beer, ale and spirits. The most popular type of beer at this time was popularly known as porter, deriving its common name from being the favoured tipple of market porters. It was a dark and thick bitter, not as high in alcoholic content as lager. 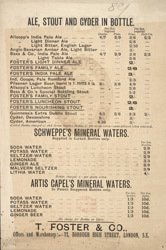 Light ales, such as those advertised on this leaflet, were often known as "table beers", suitable for drinking with dinner.